This dramatized documentary revolves around one of Australia's most legendary and "forgotten" Australians, Sir John Monash, a middle aged Jew of German descent who fought valiantly against those who would cause others harm. Combining archival footage with reconstructions, this documentary stars Robert Menzies (Blue Heelers) as Monash which carefully pieces together key parts of his life as he struggled against all odds to become one of the most influential military commanders of the Australian Corps. Through his guile and his talents as a military strategist, he managed to turn the tides of World War I and saved thousands of lives who was also responsible for Anzac. Apart from the war, he also waged a war against war correspondent Charles Bean that truly showcased the drive behind this incredible man. Ironically, this man was almost lost to history and its only been through the recent efforts of scholars and other mediums that the achievements of Sir John Monash have been brought into the open for all to know. The video quality of the dramatized events are of a high caliber of quality, however the archival footage is unfortunately a little lacking, however does assist in getting the message across. 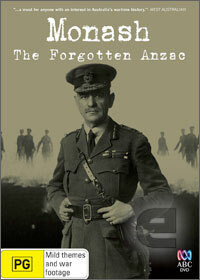 At the end of the day, Monash the Forgotten Anzac almost became part of the lost canals of Australian history, however through key individuals, his story will continue to live on for ever. Definitely a documentary for lovers of war documentaries!